Congressional Republicans who favor raising taxes on the rich to reduce the deficit are harder to find these days than salad at a state fair. One argument that is commonly made is that we cannot expect the rich to pay more until the more than half of all Americans that do not pay any income tax start chipping in. Or as Michelle Bachmann says, “We need to broaden the base so that everybody pays something, even if it’s a dollar. Everyone should pay something, because we all benefit.” Of course, these Republicans conveniently ignore the fact that most households that pay no income taxes still pay a large share of their income in payroll taxes and sales taxes. Even leaving aside this issue, there is a more basic question, how much can each group afford? Let me be frank about my own view: the only fair way to balance the budget and preserve the safety net programs that we all value is to raise taxes on people earning more than $150,000 per year. Others may disagree. 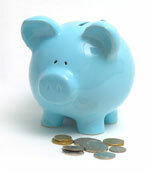 As a starting point, we should be clear about the financial resources available to different income groups. To shed light on this issue, I’ve pulled together some data from the 2009 Consumer Expenditure Survey. 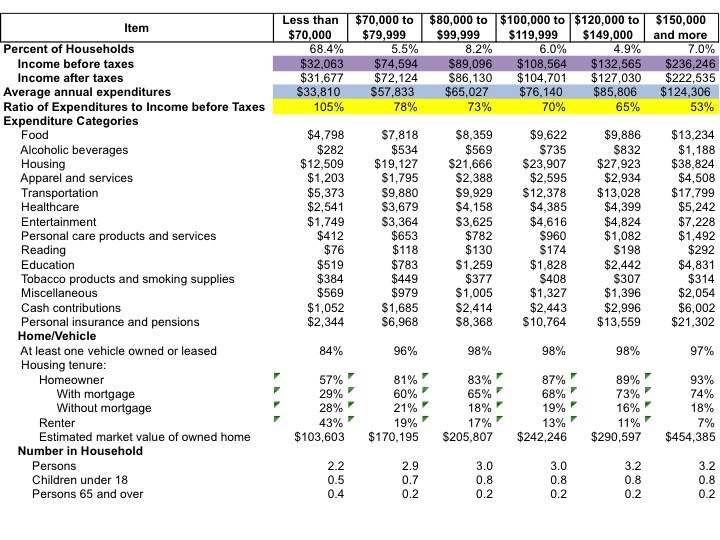 More than two thirds of American households fall into the first column – their combined annual pre-tax income is less than $70,000 (here are more income categories from the CPS). The mean income within this group is actually $32,063 per year – in part because many of these households report almost no income at all (see methodological note below). The group with incomes more than $150,000 only comprises 7% of all households. This is a basic fact about the income distribution that gets lost in policy debates where Republicans accuse Democrats of picking on “middle class” families earning less than $200,000 when they claim to be going after millionaires. How different are the consumption patterns across the income distribution? The highest income group actually consumes a reported average total of $124,306 in goods and services per year, almost four times as much as the lowest income group, and more than a third more than even the second highest income group (those with incomes between $120-$150,000). These data may be skewed by a few outlier households that buy private jets, but I would argue that if we want a measure of the total resources available in each income group comparing averages is a reasonable approach. It is also true that the lower income households tend to be smaller (2.2 people on average) than other groups, but adjusting for household size does not change the basic picture. One way to look at the financial resources of each group is to compare how much of their income goes to consumption, and how much they end up saving: the lowest group actually consumes slightly more than it saves, implying either that they are taking on debt in the year (or are underreporting their income, again, see the note below). The second lowest group, which takes in between $70-$80,000, consumes around 78% of their income, and the ratio decreases steadily for the other groups. The highest income group consume only about half of their income (53%). It’s informative to see how patterns of consumption break down by category: the wealthiest group spends almost triple the amount of the lowest on food (and close to six times on meals at restaurants, which I do not show here). They spend more than four times as much as the lowest group on alcoholic beverages and close to four times as much on clothing and other apparel. The lowest income group spends a reported $1,749 per year on entertainment – probably enough for Christmas presents and the occasional night at the movies, but not enough for a weeklong family vacation – the wealthiest group spends $7,228 per year on entertainment on average. The wealthiest contribute $21,302 for personal insurance (like homeowner’s) and pensions, compared to $13,559 in the second highest group, and $2,344 for the lowest group. The only category where the lowest have slightly higher spending than the highest group is, sadly, tobacco: $384 compared to $319. The majority of American households do not have much savings, they also have fewer assets: 53% of the lowest group own a home, compared to 93% of the highest group, and their houses are worth far less than other groups. I’m not naïve enough to think that these data by themselves make an argument about the fairest way to raise taxes. Some people might think that nobody should pay more taxes, and we should just cut back on programs like Medicare and Medicaid – certainly these data suggest that at least 7% of American households would be okay without those programs. Some people might think that households earning less than $70,000 should consume less in order to pay their fair share. These data, I think would suggest that their consumption is already relatively constrained – they are not spending a ton of money on meals at restaurants or on entertainment, the biggest item in their budgets is housing (which takes up more than a third of income), followed by transportation. If we are looking for ways to get more revenue, without making it too painful, we could do worse than raising taxes on those households earning more than $150,000. Methods Note: The Consumer Expenditure Survey collects detailed consumption data on a quarterly basis over a year for a random sample of households, the data are then aggregated, calibrated using validated methods and weighted to become nationally representative. One common concern in household surveys is that lower-income households are under-reporting their incomes. There is good evidence that under-reporting does take place, but the largest contributor is self-employment status (which affects higher income households as well). This survey imputes missing income data, but does not attempt to correct the income series for lower reporting at the bottom. Even if under-reporting as a share of income were lower at the bottom, the absolute amount of under-reported income is almost certainly higher for higher income brackets. This entry was posted in Articles and tagged consumption, fairness, income, taxes. Bookmark the permalink. before I have even read most of this I would like to thank Brendan. Can anyone PLEASE do the same for UK households? I think that both Tories and New Labour get household finances very wrong when they design their policies. In the UK there is the additional complication that, as Richard Titmuss foresaw, the middle-income groups benefit more from the welfare state than the lower income groups (and this was before you could buy your way into a “good” state school). If the median household income in UK is somewhere around £27,000 (I think it is actually less than this but it seems incredible), how is everyone affording a car, an i-phone, a large TV with satellite, as well as paying the kind of housing costs that most people face? I just don’t get it. And this is not poverty level, as Brendan points out for USA. So the consumer society is not really possible, but no one seems to have noticed. Thanks for your kind words. You can see somewhat comparable data for Britain here http://www.statistics.gov.uk/downloads/theme_social/familyspending2010.pdf especially check out the table on pages 50-51. A brief reading suggests that inequality in consumption has risen but not as fast as income inequality and thus the trends in the two have diverged. Why seems a more open question and it could be methodological rather than “real” divergence. A blog post on this by someone more in the know would be welcome.